President Donald Trump proposed a 25% tariff on imported cars in May. While the tariff is currently on hold, it represents a threat to US workers, according to the auto industry. Michigan, Ohio, Indiana, Kentucky, Tennessee, and Alabama have the highest percentage of workers in the auto industry and would likely be the hardest hit states. President Donald Trump’s threatened tariffs on imported cars and auto parts would cause massive economic upheaval in the US, but some states would get hit worse than others. Trump proposed a 25% tariff on imported cars and auto parts in May, drawing immediate condemnation from other countries and the auto industry. Major auto manufacturers ranging from Ford to Hyundai warned that the tariffs would be harmful to the industry as a whole. The major automakers warned that while the tariffs would apply to imported cars and parts, the move would also devastate US companies and lead to layoffs at stateside factories for foreign firms. For instance, Volvo warned that the 4,000 jobs it planned to bring to South Carolina could be scuttled if Trump moves forward with the tariffs. An agreement between Trump and the European Union seems to have put the possibility of auto tariffs on hold for now, but in the announcement the president said that the restrictions could move forward at any time. While the tariffs are on hold, the prospect that the hammer could fall at any time may make workers in some states more nervous than others. To get a sense of the possible impact on each of the states, we broke down the percentage of each state’s workforce that has a job in the auto industry using data from the Center For Automotive Research. The median state has 4% of workers employed in the auto industry, according to the report. Unsurprisingly, the state with the highest percentage of auto workers is Michigan – the home of Ford and General Motors – with 21.4% of workers in the sector. 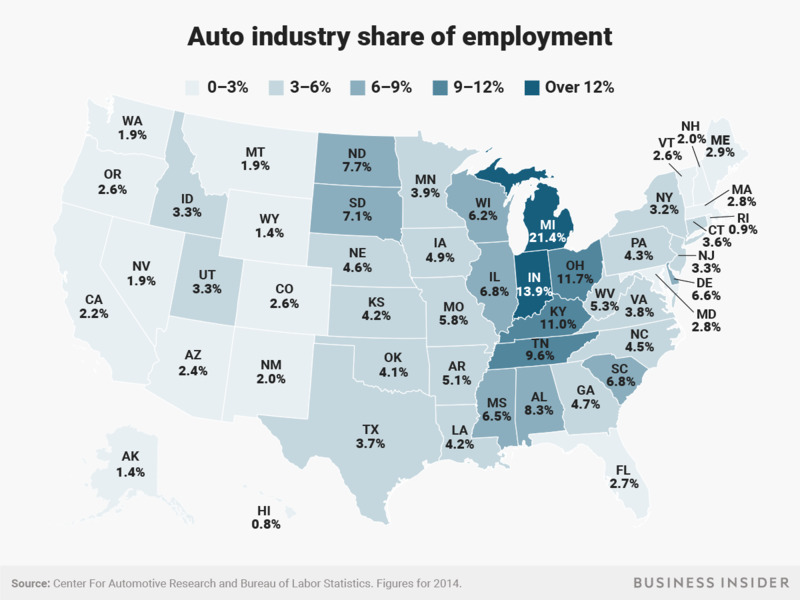 Michigan is followed by two states in the Rust Belt: Indiana (13.9% or workers in the auto industry) and Ohio (11.7%). Following that trio is a slew of Southern states: Kentucky (11.0%), Tennessee (9.6%), and Alabama (8.3%). In addition to the economic cost for the states, the move would also carry a political risk for Trump. Nine of the top 10 states and 18 of the top 20 voted for Trump in the 2016 election. The only two states in the top 20 that were won by Hillary Clinton are Illinois (6.8%) at ninth and Delaware (6.6%) at eleventh.